I hope to show with these pictures a few of the possibilities we can offer, and to inspire you to create your own unique piece of furniture. You can mix and match from what you see, or tell me about your own ideas, and I will do my best to produce a workable design that will become your very own individual work of art! All my work is numbered and recorded and I will undertake not to make a copy of your design without your permission. To give you a few more ideas, work in progress includes a Cotswold-style country house blanket chest, a Venetian palace chest of drawers, a Mediterranean style row of tall houses with shutters and pastel colours for a relaxing bedroom clothes wardrobe, and a range of smaller corner cupboards. I�m also working on ideas to incorporate mosaic and natural stone to create the geometrical floor patterns that feature in some of the designs. --do you have a particular building or style of architecture that you want to copy or use as inspiration? --can you supply photos or drawings if necessary? --if it is a specific building, will we need permission to make a copy? --what are the overall dimensions, including dimensions of any objects (eg TV) that must fit into the cupboard? We also need to consider any potential problems for delivery and access. --are there any obstructions such as skirting boards, picture rails, pipework etc that need to be allowed for? --choice of wood and finish, varnish, stain or paint? 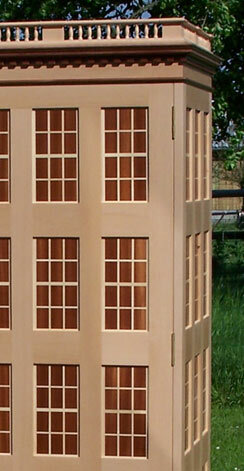 --choice of window panels, wooden, stained glass, shutters? --what is your budget? Bigger is usually more expensive, but price is determined more by the amount of individual detailed work that is required. I have given some general indications of prices to help you assess the likely cost of your project, and as and when a design is agreed I will give you a fixed price, finished, delivered, and if necessary installed, and including VAT (Europe). If this is acceptable I will ask for a one third deposit with the balance payable upon delivery. Depending on the type of installation it may be necessary to visit you beforehand (eg kitchens), and an allowance will be made for this. --delivery date? Everything is made to order so some delay is inevitable, and we will do our best to keep this to a minimum. However production time for a large piece can easily run to 6 weeks, so you will need some patience I�m afraid!